I spoke with two-time NCAA champion Steve Johnson this evening and can confirm that he's signed with Lagardere and will be represented by Sam Duvall. "I had a few different options--IMG, Octagon and Lagardere," Johnson said. "I met with all of them a few times and it kind of came down to who I felt most comfortable with. Sam was the best fit for me, and I definitely think I made a great decision." Johnson is nursing several injuries from the intense two-week marathon that constitutes the NCAA championships, but he said with rest, he hopes to be back playing in three weeks or so. "I can't run or do anything impact-wise, but I can bike and swim, pretty much everything but running for the next two weeks." Johnson said. Johnson is planning to train at the USTA Player Development Center West in Carson, California, where he has already spent time hitting with Mardy Fish, Sam Querrey and others based in Southern California. "I'm not 100 percent sure, but I think I'll be at Carson, that's my plan," said Johnson. "It's a full time deal, and Bradley (Klahn) is planning on being there as well. I think (USTA National Coach) David Nainkin will be there to help us as much as we want, and he's able to, and I think he might be one of our primary coaches at Carson, which would be really nice." As one of the most successful college players ever, with a major agency's backing, Johnson will not lack for opportunities to play big events this summer. "I'm thinking of starting at Rhode Island at the Hall of Fame Tournament, then I can see a possible scenario of working my way back west, Atlanta, LA," said Johnson, who is now ranked 375. "Then potentially DC, a couple more tournaments there, and then hopefully the Open. That's my immediate plans for the next three, four months, then after that we need to look at schedule and see what's going to suit me best." Princeton announced today that University of Alabama men's head coach Billy Pate has accepted the same position there, replacing Glenn Michibata, who resigned last month. Pate, who had been head coach at Alabama for ten seasons, is the second SEC coach to resign in the past week, following Florida's Andy Jackson. The received wisdom in Division I men's tennis says that it's difficult to get a major head coaching position, because so few good jobs open up, but that's obviously not the case this year. There is also a vacancy in the SEC on the women's side, with LSU announcing it would not renew the contract of head coach Tony Minnis, who had been with the Tigers for 21 years. Two other resignations at smaller institutions are also noteworthy. Both Jason Suscha of Butler and Sachin Kirtane of Northern Iowa were prominent members of the NCAA Division I Tournament Committee. At the ITF Grade 1 in Belgium, American Sachia Vickery has reached the singles semifinals and the doubles final. Vickery, the No. 3 seed, defeated No. 7 seed Marcela Zacarias of Mexico 3-6, 7-6(3), 6-2 and will play unseeded Kimberley Zimmerman of Belgium in the semifinals. Zimmerman is one of five semifinalists in the boys and girls draws from the home country. Vickery and Francoise Abanda of Canada, the No. 2 seeds, are into the doubles final with only two wins (due to a bye and a walkover), and will play top seeds Maria Ines Deheza of Bolivia and Elke Lemmens of Belgium. The qualifying for the French Open junior championships begins Thursday, with only two Americans, both boys, in Paris attempting to make the main draw. Thai Kwiatkowski and Stefan Kozlov are hoping to join the five US boys already in the main draw: Alexios Halebian, Spencer Papa, Mitchell Krueger, Mackenzie McDonald and Noah Rubin. Krueger and McDonald will be seeded, Rubin probably will be as well. Taylor Townsend of the US will be the No. 1 seed in the girls draw. Other Americans who received direct entry are Chalena Scholl, Allie Kiick, Sachia Vickery, Kyle McPhillips, Krista Hardebeck, Jennifer Brady and Christina Makarova. Scholl and Vickery will join Townsend as seeds, but Kiick, with her ranking at 17, may not, as there are at least 3 from the WTA's Top 300 who would move into the seeding category over her. To see the qualifying draws, go to the ITA junior website. Only a few years removed from the juniors themselves, Americans Lauren Davis and Christina McHale will play in the second round of the women's draw at Roland Garros on Thursday. Now ranked 162, Davis, who won three qualifying matches and defeated No. 30 seed Mona Barthel of Germany 6-1, 6-1 in the first round, will be the underdog against McHale, ranked 36th. But Davis is very comfortable on the clay now, having also qualified in the WTA event in Strasbourg, so I'm expecting a very competitive match. The winner will probably get defending champion Na Li of China in the next round. Sloane Stephens today made her way into the third round, defeating Bethanie Mattek-Sands of the US 6-1, 6-1. She will play Mathilde Johansson of France next. For complete draws, see the Roland Garros website. The men's tennis program at the University of California-Riverside isbeing considered for elimination, and on May 18th, this request for comments was published on the university's athletic website. Women's sand volleyball would be added if men's tennis is cut. Over at the website TennisInsiders, which is based in Southern California, Steve Bellamy has provided additional information and a forum for support. According to those familiar with a university meeting today, the program has been extended for another year, but not beyond. For more on the decision today, see this article. The US Open National Playoffs began earlier this month, with the Southwest section and the Florida section winners now in the books. As in the past two years, the sectional winners in men's and women's singles receive an opportunity to compete in the National Playoff in August for a US Open qualifying wild card. 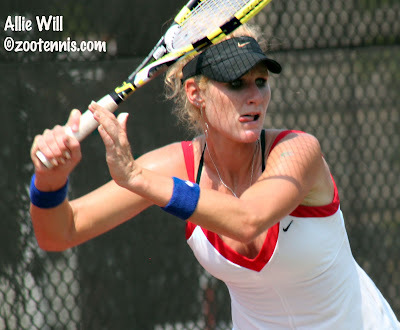 The mixed doubles winners on the sectional level compete for a US Open main draw wild card. The winners in USTA Southwest are: Brian Battistone, men's singles, Stephanie Vlad, an Arizona State recruit, women's singles, and Battistone and Nicole Melichar, mixed doubles. The USTA Florida winners are: Eric Hechtman, men's singles, Sandra Roma, women's singles, and Ryler DeHeart and Megan Fudge, mixed doubles. DeHeart and Fudge, both former players at Illinois, are married. Roma, of Sweden, beat 15-year-old Jessica Ho in the final; Hechtman, a former Miami University player, beat DeHeart in the final. 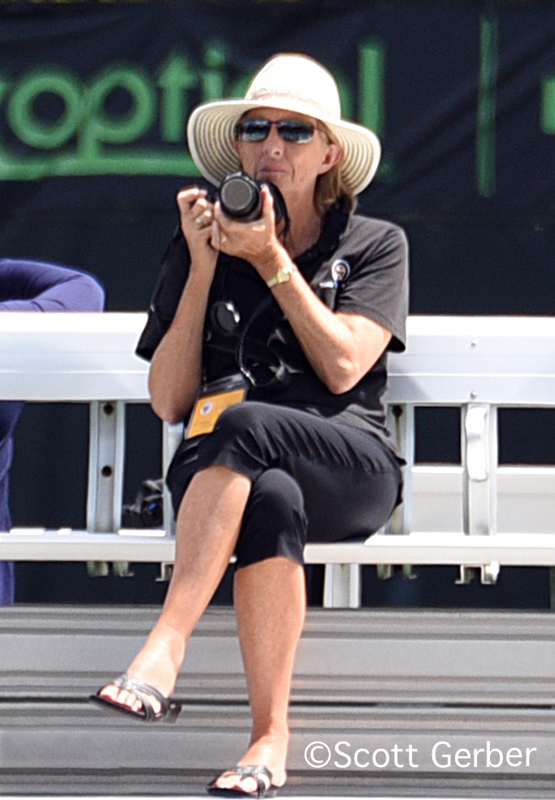 For more on the Florida finals, see the USTA Florida website. The number of entries in the women's draws have been disappointing, with only eight entries in the Southwest and nine entries in Florida. With college tennis over now, there should be more collegians in the draws, and there are many sectional tournaments still accepting entries. For a complete list of the remaining sectional playoffs, with entry closing dates, click here. USC, Florida Top ITA Final Rankings; Virginia Men and Georgia Tech Women Voted No. 1 Recruiting Classes; Ward-Hibbert to Texas A&M; Title IX Not to Blame? I'm confessing I'm really tired after those 12 exceedingly long days at the NCAAs in Athens and nothing sounds better to me right now than 10 hours of sleep followed by sitting in front of the television watching the French Open and not writing about it. I know I've got a lot of junior and pro circuit news to catch up on, and an NCAA recap, notebook and the slideshow/videos to work on, but tonight I am just going to pass along several brief college items. 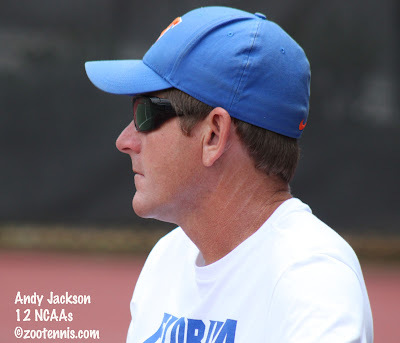 The ITA's final rankings are out, with the NCAA champion USC men and Florida women at the top. Complete final team rankings can be found at the ITA website. The final individual rankings will be released next week. 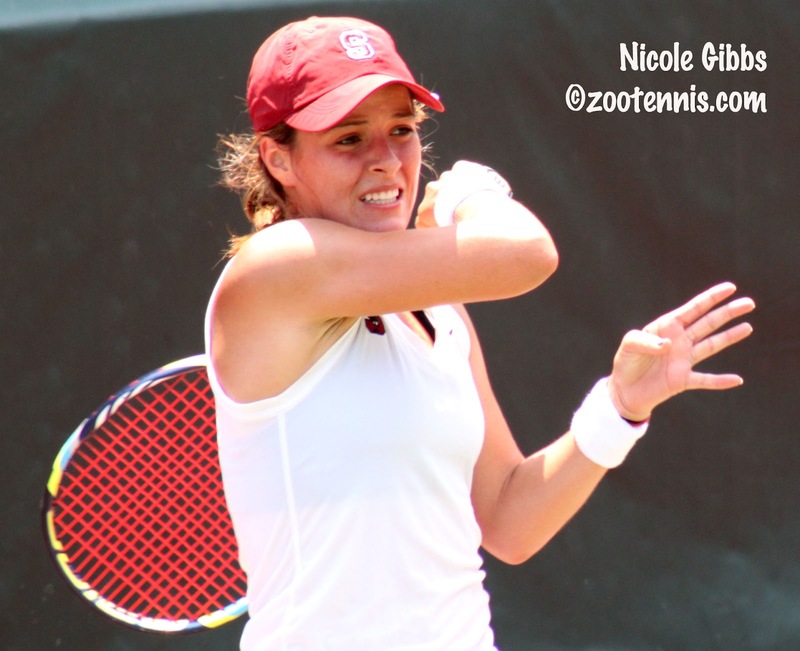 The Tennis Recruiting Network released their spring recruiting class ranking polls recently, with the Georgia Tech women and the Virginia men claiming the top spots. Virginia is followed by Stanford, Duke, Texas A&M and Texas in the men's rankings. Georgia Tech is followed by Virginia, North Carolina, Vanderbilt and Stanford in the women's rankings. I'm fairly certain Texas A&M would have finished higher had their newly announced recruit been considered. On Monday, the Aggies announced they had signed Joshua Ward-Hibbert of Great Britain. 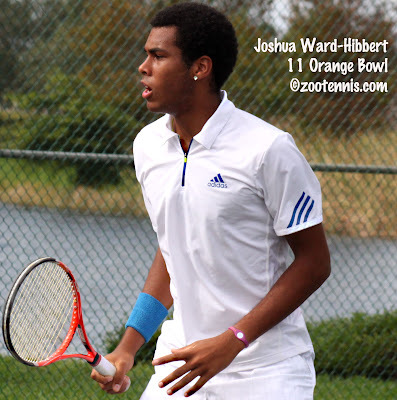 Ward-Hibbert just reached the ITF Top 10, winning the Grade A Italian Open with Liam Broady, and there's no question his best junior results have been in doubles. But he has a huge serve, a strength A&M coach Steve Denton knows well, and he is certainly one of the most sought-after recruits of his 1994 birth year. The complete release is here. And finally, last week ESPN W published this column laying the death of many non-revenue college sports not on Title IX, which is the usual suspect, but on the NCAA itself for deciding how many scholarships can go to which sports rather than letting the individual schools decide. It's a long article, but it explains clearly, with charts, just how much the revenue sports influence the decision the NCAA makes for less popular sports. With all its marketing of the student-athlete experience, regardless of sport, the NCAA seems to want it both ways. It caters to the sports that generate revenue, but then tells the schools that are able to do that how they should spend that money on sports that don't. Joy is not the only emotion 2012 NCAA champions Steve Johnson of the University of Southern California and Nicole Gibbs of Stanford felt after Monday afternoon's finals. Johnson also felt relief, not only because he had accomplished the goal that brought him back to college tennis--a fourth consecutive national team championship--but because the Trojan senior could finally give his aching body a rest after 12 days of relentless, high pressure tennis. His 6-4, 6-4 victory over Eric Quigley on a warm and humid Memorial Day afternoon at the Dan Magill Tennis Complex gave him a second consecutive NCAA singles title, and he leaves college tennis as the only player to have ever won the team and individual championships in consecutive years. Gibbs, like Johnson, is known for her competitive fire, and that was on display throughout her 2-6, 7-6(5), 6-3 victory over teammate Mallory Burdette. But even after Gibbs squirmed her way out of a 6-2, 4-1 deficit, escaped a 4-5, 0-30 hole later that set and was down 5-2 in its tiebreaker, the Cardinal sophomore was subdued she won the final point of her nearly three-hour comeback. She had the feelings of her doubles partner to consider, after all. "I got to look that kind of pain in the eye," said Gibbs, 19. "In the second set, just being down 4-1, 5-4, 5-2 in the breaker, I saw it multiple times, that feeling of putting that much into a match and coming out the loser. So I know how tough it is, and obviously I wouldn't wish that on my teammate in any other situation. I'm happy that I won, but I'm sad for her as well." Burdette started out as she had all tournament, hitting big and keeping her opponent on defense. She used her power to keep Gibbs running from side to side and tossed in a few deft drop shots and volleys just for good measure. In the second set, she broke Gibbs in the fourth game and held to make it 4-1, but Gibbs got her first break of the match with Burdette serving at 4-2, and the door opened. "Gibbsy is very good at stepping it up when her opponent is about to close things out," said Burdette, a junior. "That's kind of her specialty. She definitely made it tough out there for me in the end and I didn't have the guts to finish it today." Burdette was two points from the match with Gibbs serving at 4-5, 0-30, but Gibbs won four straight points to make it 5-5. Burdette was again two points from the match at 5-2 in the tiebreaker, and again Gibbs seized control, taking the final five points to force a third set. In contrast to No. 5 seed Burdette, who hadn't lost more than three games in a set in her previous five matches, Gibbs, the No. 3 seed, was pushed to three sets twice and was on the court many more hours than Burdette. Rather than seeing that as a negative, however, Gibbs focused on what she had gained from those tests. "I think it provided me with every advantage," Gibbs said. "A lot of people were asking me how I felt about that scenario leading into this match because they thought she would have the advantage going into the final physically at least, but I was thinking to myself that I was very mentally conditioned, if not physically. I had been through every possible scenario this week--I saw a loss right around the corner in my second round against Joanna Mather and I was able to fight my way back into that one, so I knew I had it in me today, and it proved to be crucial." In the third set, Gibbs got the only break with Burdette serving at 2-3, and began to play more aggressively, while Burdette's unforced errors, so rare this week, began to multiply. As dark clouds began gathering in the east, Gibbs served for the championship, and predictably, it wasn't all smooth sailing. She fell behind 15-30 with Burdette hitting two winners, saved a break point at 30-40 with an overhead, and after an error by Burdette, got to match point with an ace. Another good first serve, that Burdette returned long gave Gibbs the NCAA championship, the 13th for a Stanford woman. While Gibbs and Burdette were nearing the end of their second set, No. 1 seed Johnson and No. 3 seed Quigley were, a court away, at that same stage. Johnson had used a break at 4-4, assisted by two double faults by Quigley, to move in front in the first set, and he served it out, punching the air and jumping energetically after securing the set point. The second set followed a similar pattern: the points were short, with first serves dominating, and Quigley blinked first. At 3-3, Quigley double faulted at 30-30, and then netted a forehand to make it 4-3 Johnson. Two quick holds and Johnson was serving for his second consecutive NCAA singles title. Three big first serves later, Johnson was at match point. He didn't convert the first, sending a forehand long, and on the second, he missed his first serve, which resulted in one of the longest points of the match. Johnson parried several big forehands from Quigley, who eventually netted one. Johnson's reaction--falling to his knees and letting out a primal scream--demonstrated just how much he had kept inside during the week and during his 72-match winning streak. Although suffering from an abdominal pull sustained in his quarterfinal win over Alex Domijan of Virginia and playing with a shin problem that might be a stress fracture, Johnson still performed several improbable adrenaline-fueled physical feats. He hoisted himself over the chain link fence separating the bleachers from the courts and ran up the steps, seeking his mother and father, who had started in the opposite direction to make their way courtside. Johnson then picked up USC athletic trainer Sandy Olsen and carried her from her position on the far side of the court to the changeover area. "She's a lifesaver," Johnson said. "She spent more hours with me this week than she'll ever spend with another person in her life." Johnson said he didn't consider retiring in singles, although he did retire from his quarterfinal doubles match on Saturday. "I really feel like I kind of let Roberto down," Johnson said of his partner Quiroz. "But after that singles against Domijan, I was full body cramping and they told me not to go out there and play doubles, but I did. But I didn't physically have it in me, and at that point, I hit an overhead in that last game that just completely ripped my stomach apart, I feel like, and I couldn't hit any more balls." Although Johnson was obviously wincing in pain on numerous occasions throughout the match, Quigley said he didn't detect any physical problems. "I wasn't aware of that, and I don't think his serve was showing any signs of fatigue or anything," Quigley said. Johnson admitted that his first serve wasn't affected much by his stomach injury. "It was getting me more on my second serves," Johnson said. "A lot more double faults, I think, in my last few matches than normal. The second serve, where I would be bending back, would be the hardest motion for me, on the second kick serve. But the first serve, it felt okay, and I knew going into yesterday that I had a maximum of six sets in me, and then I was done, so I really just went out there and gave it my all, hoped for the best, and everything stayed intact." "No one will ever know how hurt he was," said USC coach Peter Smith. "He had food poisoning last week, and he's probably not going to play for four to six weeks...but I knew if he could see the finish line, he'd get through it, because that's the type of kid he is." While Quigley would have preferred to win, he was already savoring the memory of his final college match. "It's unbelievable for me to finish my career like this," said Quigley, Kentucky's all-time leader in singles wins. "I'm a little disappointed, but I can't complain whatsoever. To play my last match in a national championship, I'm really lucky and happy that I got to go out at a place like Dan Magill Tennis Complex, in front of him. It was really special to me." Johnson will now rest and prepare for a full-time commitment to the professional tour, and can be expected to receive a US Open wild card, as he did last year, losing in five sets to Alex Bogomolov in the first round. "If the wild card comes, I'll be very happy to go back and give it my best again," Johnson said. While Johnson was collecting his second consecutive singles title, Burdette was able to put the singles final loss behind her and take her second consecutive women's doubles title. Burdette and Gibbs, the No. 2 seeds, had already made history by reaching the singles final against each other and playing in the doubles final, as no two competitors from the same school had accomplished that. With the courts wet from a brief rain shower, the NCAA committee decided to move both doubles matches indoors: the men's final, which was underway, and the women's final, which had not yet begun. Burdette and Gibbs were facing the unseeded team of Nadja Gilchrist and Chelsey Gullickson, and although the rain had kept the crowd smaller than it might have been, the Bulldogs had a definite home court advantage. Burdette and Gibbs, obviously warmed up and ready after their singles encounter, got off to a good start, which helped offset Gilchrist and Gullickson's advantage. After taking the first set 6-2, Burdette and Gibbs led 3-0 in the second, but the Georgia team fought back to 3-3. The crowd had hope, but even after Burdette was unable to close it out, serving for the match at 5-3, it was dashed in the next game. Down 15-40 with Gilchrist serving, Gibbs pounded a return winner to claim her second NCAA national championship of the day, by a 6-2, 6-3 score. "We had no real nerves in the final, we had already been out on the stage earlier," said Gibbs, who is the first woman since Keri Phebus of UCLA in 1995 to capture both singles and doubles titles. Burdette was happy to play indoors, despite little experience on them in the Pac-12. "I thought it was great. I love fast courts," said Burdette, who won the doubles title last year with Hilary Barte, and now has one more NCAA doubles championship than her older sisters Erin and Lindsay. "I like people who hit hard, take their pace and make something out of it, so I loved it in there." Stanford coach Lele Forood suggested Monday was one of the best days in the Cardinal program's formidable history. "It's probably one of the biggest days in our program's history today," said Forood. "It's very exciting, especially because no one's graduating. It's quite an amazing day, and the fact that it's hard to play your teammate in such a big moment, and then to come back and double with them and win a title is a testament to how mature they both are, and could do what they had to do today." The men's doubles final between Ohio State's top-seeded team of Chase Buchanan and Blaz Rola and unseeded Raony Carvalho and Gonzalo Escobar of Texas Tech was at 5-4, on serve in the first set when the rain began. At stake was not just an NCAA title, but for the Ohio State pair, a chance to become the first team to claim all three collegiate majors in the same academic year. The Ohio State pair had returned to their hotel, thinking they had at least an hour to relax, when word came the match would resume in 30 minutes. Although they didn't have an opportunity to warm up, Buchanan and Rola didn't show any signs of it, and played an excellent tiebreaker to claim the first set 7-6(4). Carvalho and Escobar, who had been playing together as a team only since March and were the first Texas Tech team to reach the NCAA final, lost their first service game of the second set, and were not able to recover. Buchanan and Rola didn't face a break point in the final set, and broke Carvalho in the final game for a 7-6(4), 6-3 victory and the unprecedented triple crown of doubles. "We certainly felt the adrenaline rush on the match points, getting the chance to do that," said Rola, a sophomore. "So many good doubles teams have been playing in college that winning those three events, as the only couple, is just unbelievable." "I didn't really think about it today until that last game," said Buchanan, a senior. "When it was like 0-30, I was like, oh my god, we might do it." Ohio State coach Ty Tucker pointed out the difficulty his players faced after winning the All-American in October and the USTA/ITA Indoor in November. "They spent the whole time as No. 1 in the country, and everybody knows if you beat Rola and Buchanan you make the NCAAs (field)," Tucker said. "They never got a day off, because a win against the 1 team in the country will throw you up in the Top 20 right now. They always came for the challenge. It's unbelievable what they did, and I'm so happy for them, especially Chase. He's meant so much to the program." 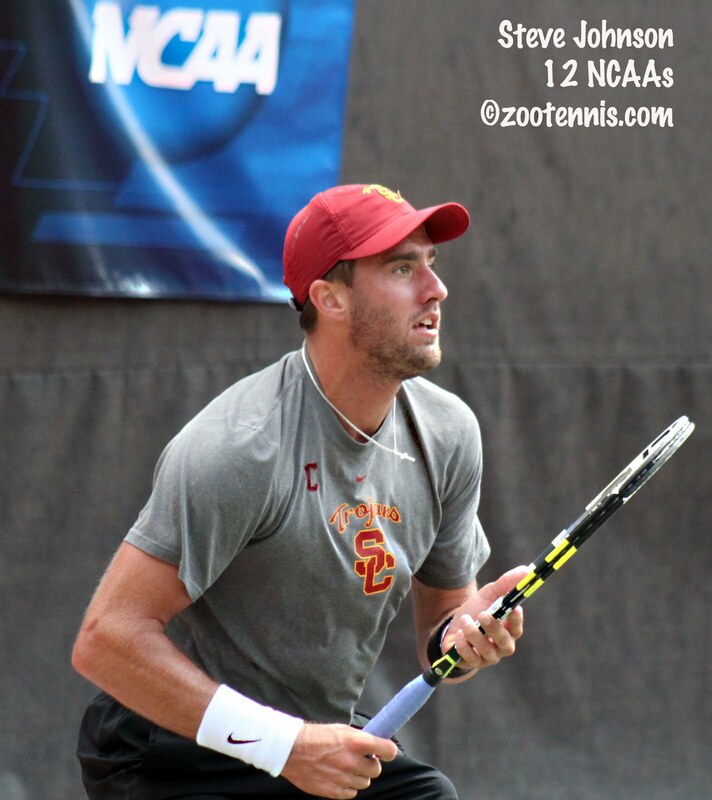 Four team titles and an NCAA singles championship haven't yet sated Steve Johnson's appetite for college tennis. After a hot and grueling week in Athens, the Southern California senior knows there is one last morsel left--another title and a US Open wild card. Kentucky's Eric Quigley, a senior who also knows his last match is for the NCAA championship, is the last player with an opportunity to end Johnson's 71-match winning streak. 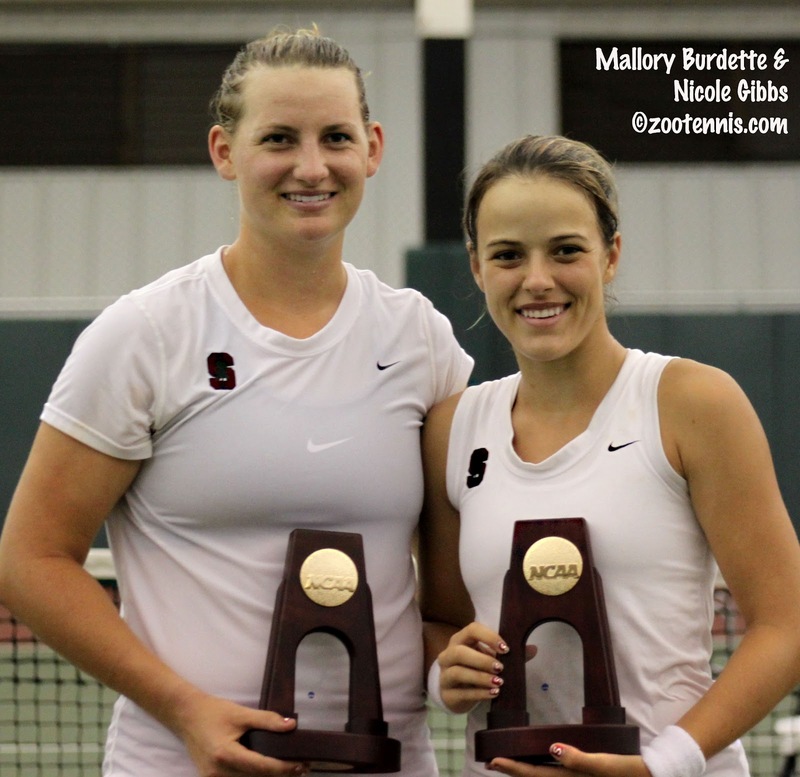 The women's final will feature teammates and doubles partners Nicole Gibbs and Mallory Burdette of Stanford, who have made some history of their own. By reaching the finals in singles and in doubles, the pair become the first women to play in both championship matches. Gibbs, the No. 3 seed, beat top seed Allie Will of Florida 6-2, 4-6, 6-3, in her characteristically gritty fashion. Leading 3-1 in the third set, Gibbs needed to consolidate her break, but was down 0-30. Four times Will hit an overhead, and four times Gibbs got it back in play, eventually coming up with backhand passing shot to win the point. She went on to hold for a 4-1 lead, then broke in the next game to assure herself a place in the final. "That was a definite turning point," said Gibbs, who reached the NCAA semifinals last year as a freshman. "It gave me the confidence to finish out the set. Allie Will is a great competitor and I wasn't counting her out at 3-1, especially when she was up 0-30 in that game. So just sticking in that point, making her play for it. Lele (Forood) told me on the previous changeover to stop lobbing her when she came to the net and to pass her, and I ended with a backhand down-the-line passing shot, so I think that made her happy too." Will gave credit to Gibbs, whom she had beaten this year in a dual match at Stanford. "I know she is going to compete and fight as hard as she can, like she always does," said Will, a junior. "She did a great job of that today. She served better than normal today, made a lot of first serves, probably because I started going after her second serves. She did a good job of adjusting in the third." While Gibbs was still working to put Will away, Burdette was in the stands with her sister Lindsay, cheering for her teammate. Burdette had eliminated freshman Zsofi Susanyi of Cal 6-2, 6-2 in just over an hour, using her impressive power and an improved attitude to post her fifth consecutive straight-set win. "I think in terms of my mental game, this is the best that I've played," said Burdette, a junior who grew up in the central Georgia town of Jackson. "In terms of my tennis game, it's not anything spectacular, and I try to think of them as two separate things." Two people with intimate knowledge of Burdette's game weren't buying it. Coach Forood said she thought Burdette was playing her best tennis--she hasn't lost more than three games in any set--and Susanyi agreed. "She was on fire today," said Susanyi, who was 0-2 against Burdette this season. "She played a really, really good match. I honestly think she played better today than she did in our last two matches." Gibbs and Burdette have already played once, back in the October regional, when Gibbs won 7-6 in the third. At stake Monday is more than a berth in the National Indoor. Because both are Americans, the winner will likely receive a main draw wild card into the US Open. "It's a bonus," said Burdette. "If I were to win, we'd still have to wait to see if the USTA would want to give a wild card to me, so it's just so far off, so far out of my control, I can't do anything about that. And there's a lot more tennis to be played before then." Gibbs admitted that she thought about the wild card possibility during the week. "It's a significant motivating factor," Gibbs said. "Just knowing it's there, or possible there. It's kept me resilient in a few situations this tournament when I was on the brink of breaking down, especially in the Joanna (Mather) match, down 3-0 in the third, down points for 4-0, and I'm thinking, I want to keep myself in the hunt for the title and potentially a wild card." 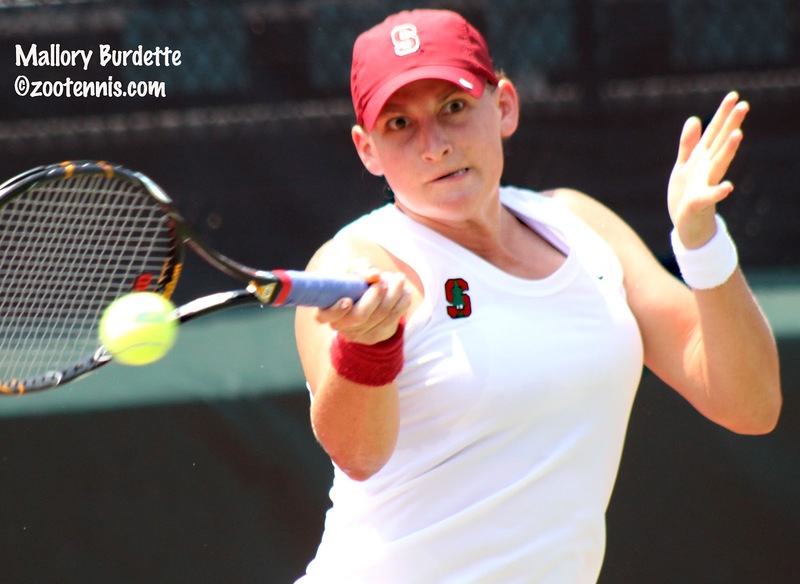 Gibbs and Burdette are the first teammates to play each other in the final since 2001, when Stanford's Laura Granville won the second of her two consecutive titles against Lauren Kalvaria. Forood was in her first year as Stanford head coach then and also was head coach in 2005, when two of her doubles teams played each other in the final, so she knows how to cope. "It's as easy as it gets," Forood said. "We go sit in the stands, high up." "I'm excited for a battle tomorrow," said Burdette. "I think there are going to be some great points out there, a lot of good sportsmanship, I hope, but no matter what, there's going to be a battle. And I hope we both enjoy it. As they say, may the best player win, on that day." "We're both looking forward to the competition. It's what we love and what we live to do, so the fact that we're in the finals together is incredible," Gibbs continued. "We have a for sure Stanford winner and you can't go wrong with that, but I think we both have the will to win, so it's going to be a very entertaining match tomorrow." The men's final won't have the same family dynamic, but both Johnson and Quigley are seniors who are looking to end their careers with an NCAA title and a US Open wild card. Quigley, the No. 3 seed, showed he was ready for the pressure of the final by coming back to defeat Ohio State's Blaz Rola, a 9-16 seed, 2-6, 6-1, 7-6(1), while serving from behind throughout the final set. Whenever his service games got close, Quigley used his serve to bail him out, and Rola was unable to shake his confidence in that stroke in the 4-5 and 5-6 games. "I was serving great, so there was no need for me to get tight," said Quigley, the third Wildcat to reach the NCAA singles final. "I was able to serve great, I thought, the whole third set and I got a great start in the tiebreaker and didn't let go. I really wasn't nervous and I was playing great. I've had a great record in tiebreakers this tournament (4-0 including today), so I was liking my chances if I could get to a tiebreaker." Rola started the tiebreaker with a double fault and never recovered from that. "My focus just went down after that first double fault," said Rola, a sophomore from Slovenia. "I'm really disappointed about that tiebreaker. It was only one point in the tiebreaker, it's a huge mistake, but it shouldn't have thrown me off or anything. You have to win seven points and that was only one." Rola managed an angled, running forehand pass to make it 2-1, but lost the next two points on his serve, and Quigley hit two good serves, including an ace, that made it 6-1. The right-hander from Pewee Valley, Kentucky needed only one of those match points, with Rola netting a backhand early in the rally. Quigley said he won't approach the final any differently despite all that is at stake. "I'm just trying to make it as routine as possible, just another match," Quigley said. "If I try to think of what's on the line, I think I will start to get nervous. I've been playing great, not thinking about nerves, so I'll just keep it a routine match." Johnson has considerably more experience in high-stakes matches, with his four NCAA team titles, a singles title last year, and a first round match at the US Open, yet he recognizes there is plenty of pressure awaiting him in his final match. "To have the potential wild card on the line for the US Open just adds to the pressure of an NCAA final," said Johnson, who beat Tennessee's Rhyne Williams in a three-set final last year. "But having been there in the team and in the singles last year, I think I'll be able to handle it pretty well. I know what it feels like to be there, so I'll come out ready to go." 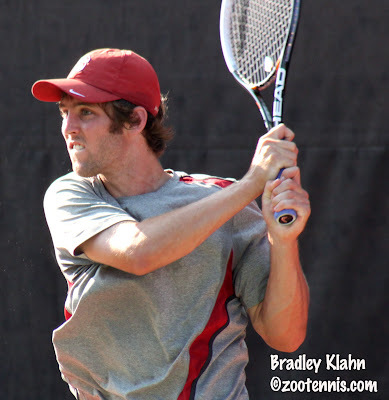 In his 6-4, 7-5 semifinal win over 2010 champion Bradley Klahn of Stanford, Johnson was able to serve well enough to keep the pressure on his longtime friend and frequent college opponent. "I played smart today, served really smart," said Johnson, who was only broken once in the match, after taking a 2-0 lead in the second set. "I think that was the key, knowing I could hold easy and take my chances on his serve." With Klahn serving at 4-5, 0-30 in the first set, Johnson came up with his best shot of the day, anticipating perfectly and picking off a blazing forehand from Klahn after a lightning-quick rally. Two points later, Johnson had the first set, and as Klahn said later, Johnson is tough to beat when he gets a lead. "He's a great front-runner, and I knew going in if I could get that first break or get on top of him a little early, I could really change a lot of things," said the left-hander from Poway, Calif. "In the past, he's gotten up early breaks and the way he's confident in his serve, he rides that momentum." Johnson did falter a little in the second set, after going up 2-0, but he shrugged it off. "I made a serving mistake 30-15 up, then a let cord, he hits a winner and comes up with an incredible lob," said Johnson. "Not much you can do about it, but after that point it was just kind of trading holds until I was fortunate enough to get that break at 5-6." At 40-30 in the final game, Klahn missed two forehands and Johnson had a match point. He didn't have to hit a ball, as Klahn double faulted to give Johnson the win. Quigley and Johnson have not played since last year's quarterfinal in the NCAA team championships, a match Johnson won 6-4, 6-2. "I've known Eric for a long time," said Johnson. "I know how he's going to come out and play. He's going to hit the ball hard and go for his shots. I know what it takes to beat him and hopefully I can execute tomorrow," said Johnson. The doubles finals are set, with Burdette and Gibbs, the No. 2 seeds, taking on hometown favorites Chelsey Gullickson and Nadja Gilchrist of Georgia. Burdette and Gibbs defeated the unseeded Tennessee team of Natalie Pluskota and Kata Szekely 7-6(1), 6-1, while the unseeded Gullickson and Gilchrist delighted the hundreds of Bulldogs fans with a 7-6(5), 6-4 victory over unseeded Courtney Dolehide and Pam Montez of UCLA 7-6(5), 6-4. Burdette is the defending NCAA doubles champion, having won the title last year with Hilary Barte. Although there is no longer a possibility of a Triple Crown (singles, doubles and team titles) for USC, the Ohio State Buckeyes can claim a similarly impressive distinction. Top seeds Chase Buchanan and Blaz Rola, who reached the final with a 4-6, 6-3, 6-4 win over unseeded Costin Paval and Dane Webb of Oklahoma, can become the first team to win all three collegiate majors in the same year. Buchanan and Rola also won the ITA All-American in October and the USTA/ITA Indoor Intercollegiate Championships in November. In their match against Paval and Webb, which started in bright sunlight and ended around 9 p.m. under the lights, Buchanan and Rola trailed 3-0 in the final set before turning it around. "We were struggling," said Buchanan. "We were just able to find a way." "Maybe during the doubles I was thinking this was one of the days when everything goes wrong," said Rola, who had lost in the semifinals to Quigley just a few hours earlier. "Thank god it's not that day." After breaking Paval to take a 5-4 lead in the final set, Rola served his team to a 40-0 lead. Three match points came and went and when Rola netted a forehand, they were down break point. But the left-hander snapped off an ace and a lob winner to earn their fourth match point, which they converted when Webb just missed a forehand return. "It was not fun standing over there for the serve on that break point," said Rola. "But a good serve, a slice out wide, helped me a lot today." Rola and Buchanan will play unseeded Raony Carvalho and Gonzalo Escobar of Texas Tech, who have yet to lose a set in the tournament. On Sunday, Carvalho and Escobar defeated Chris and Marcel Thiemann of Ole Miss 6-4, 6-2 and are the first players from Texas Tech to advance to an NCAA final. Both the men's and women's singles finals are scheduled for noon on Monday. The doubles will follow on the two courts, with the women's doubles likely to be later due to the need for rest for Gibbs and Burdette. Another chapter in the rivalry that is reaching the length of the novel War and Peace will take place Sunday afternoon at the Dan Magill Tennis Complex, when top seed and defending champion Steve Johnson of Southern California faces 2010 champion Bradley Klahn for a place in the NCAA Division I singles final. Klahn is the last player to beat Johnson, with that string extending back to January 17, 2011, and since then Johnson has won 70 matches in a row. Johnson's 70th, a grueling 6-0, 5-7, 6-1 win over unseeded Alex Domijan from Virginia was not what he wanted, especially given the temperatures, which had already reached 87 degrees when the match began at noon. Johnson breezed through the first set, barely losing a point, and playing some jaw-dropping tennis, but Domijan didn't get discouraged, and had two break points at 5-5 in the second. His passing shot skipped off the netcord with Johnson at the net for 15-40, but Johnson saved the first with a confident overhead. At 30-40 it was the Cavalier sophomore who put the pressure on, approaching the net himself, and when Johnson's backhand pass went wide, the match was even. With the heat rule in effect, there was a 10-minute break between sets, and Domijan seemed ready to continue his push, earning a break point in the opening game. Johnson saved it however, and got a break in the next game, and went on to take a 5-1 lead. Serving for the match, Johnson double faulted at 40-30, then just missed a lob to give Domijan a break point, which Johnson saved with an ace. Another ace gave Johnson another match point and he never got the ball in play, double faulting again. Another double fault and Johnson's fifth miss of a serve in a row gave Domijan another break point, but Johnson saved that with an overhead winner. A forehand winner gave him a third match point and he double faulted it away again. He didn't make any first serves in this stretch, but his forehand remained lethal and he earned a fourth match point, and, like Groundhog's Day, he again double faulted. Finally, on match point No. 5, he missed his first serve, just barely, but made his second and hit a forehand winner to claim his place in the semifinals. "It was more mental," said Johnson, when asked his reason for all the double faults. "I think at that point I was exhausted from the heat, and having such a good first set, so dominant, and then a tough second set lost, and in the third set I wanted to close it out at 5-1. It just got to me mentally that I double faulted, which is completely unlike me. To do it four straight times is, I guess special, but to still win the game was kind of a testament to my mental toughness out there towards the end of the match." Johnson and his partner Roberto Quiroz, seeded second, retired from their quarterfinal doubles match against Texas Tech's Raony Carvalho and Gonzalo Escobar trailing 6-2, 3-2, and at times in that evening match, Johnson appeared to be in pain. "After singles I was feeling just exhausted physically and I tried to come out here and play doubles, but my body just wasn't holding up," said Johnson, who had an ice bag wrapped around his stomach area. "I knew more time on the court would be bad for me, so I just decided the body wasn't feeling good, so just call it a day. The heat finally got to me today, and I've 12, 16 hours to get ready for singles tomorrow against Bradley, so I'll get up in the morning with a better attitude, I think." Klahn had a less taxing win in the quarterfinals, defeating Ole Miss freshman Nikola Scholtz, a 9-16 seed, 6-1, 6-3. Scholtz had played three consecutive three-setters in advancing to the quarterfinals, and in the extreme heat was no match for the 2010 NCAA champion. Klahn also had a doubles match and it was nearly 8 p.m. when he and Ryan Thacher, the 2011 finalists and seeded fourth this year, lost to unseeded Costin Paval and Dane Webb of Oklahoma 7-5, 6-7(4), 6-3. After his singles match, Klahn said he was pleased with his overall physical condition. "My fitness is feeling pretty good, and I feel fit and fresh. I couldn't be happier with the way my back is holding up this week," said the senior, who had surgery for a herniated disc last October. "It's hot today, obviously, so it's nice to get a straight-set win and get on and off the court pretty quickly against a great opponent." Although Johnson said he's played Klahn "way too many times to count," Klahn threw out a number, saying he thought Sunday match would be their 14th, in college alone. "If you count the practice sets, you're looking at a couple hundred," said Klahn, who grew up with Johnson playing junior events in Southern California. "Steve and I go way back and we're going to be training together this summer, probably living together. I was lucky that I was the last one to beat him, but he's certainly put together a string of unfathomable records, to say the least. You don't win 70 matches without playing with a lot of confidence, but at the same time, I feel I'm playing better and better each match." Johnson, who has beaten Klahn in straight sets twice in the past six weeks, is eager to play his friend again. "I'm just more or less happy that Bradley's back playing and playing at a high level," Johnson said. "To come back from that back surgery, to be back to where he is now is pretty remarkable and I'm really happy for him. He's a good buddy of mine, and I know it's going to be a good match tomorrow." The other men's semifinal will feature No. 3 seed Eric Quigley of Kentucky against Blaz Rola of Ohio State, a 9-16 seed. Rola, playing outstanding tennis, surprised No. 2 seed Mitchell Frank 7-6(5), 6-1, dealing the freshman from Virginia, who won both fall individual majors, only his second loss of the season. "It was a great day for me," said Rola, who reached the quarterfinals last year. "I played unbelievable. I'm hitting my forehand really well, and for the last two rounds, I've also been serving well." Quigley downed No. 5 seed Henrique Cunha of Duke 6-4, 6-3 and he also attributed his success to his serve, which is not surprising, after hitting two consecutive aces to close out the match against Cunha. "I think we were both tight in the beginning," said Quigley, a senior who has reached the Final Four for the first time. "I know I was, but even in the beginning, I felt that I was serving well. I feel like I've served really well throughout the tournament." Quigley and Rola have not played this year, as Rola was playing at No. 2 both times Kentucky and Ohio State met, but they split their two decisions last year. "It will be a tiebreaker tomorrow," Quigley said. His doubles partner Panav Jha plans to stick around to support his teammate Sunday, but he faces a dilemma if Quigley advances to the final. "I really want him to win," said the sophomore. "But I think even if he wins tomorrow I think I'm going to have to head home. I've got summer school. But being here is great and being around Eric, seeing how professional he is, really helps me. He's quite an accomplished player, and at times he's carried me." 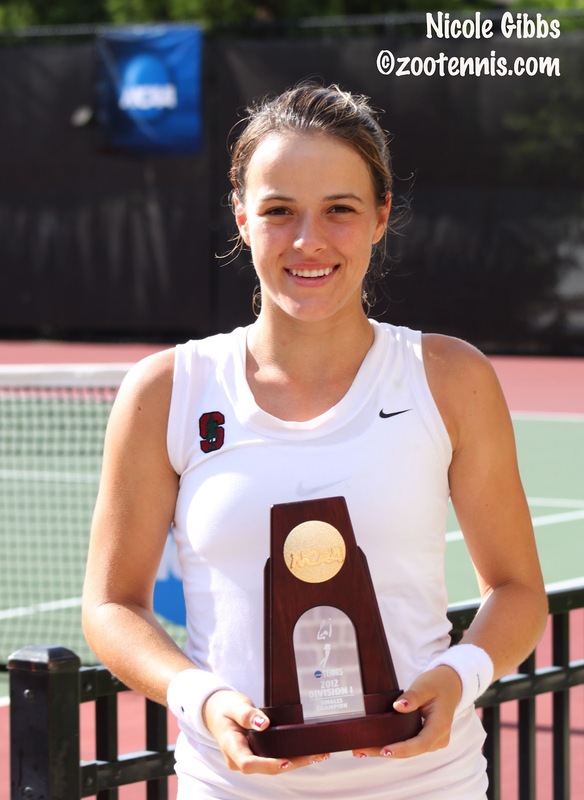 The women's semifinals feature two Stanford players, junior Mallory Burdette and sophomore Nicole Gibbs, and Burdette is hoping to see her teammate in the final. "Of course, why not?" said Burdette, when asked if she wanted to play Gibbs in the final. "It's a chance for a Stanford player to come out with a win." Burdette beat No. 2 seed Beatrice Capra of Duke 6-3, 6-2, in a match that took over two hours despite the seemingly routine score. "I knew I was going to have to be really aggressive," said Burdette, who is from Jackson, Ga., about an hour and a half from Athens. "She was going to make me play a lot of balls, and I think I did a good job of staying level-headed and just taking it one point at a time." Burdette will play freshman Zsofi Susanyi of Cal, a 9-16 seed who ended the run of unseeded Sabrina Santamaria of Southern California 6-2, 7-6(4). Burdette has beaten Susanyi twice in the last month, both times in straight sets. Gibbs took out defending champion Jana Juricova of Cal, who had eliminated Gibbs in the semifinals last year in Stanford, 6-2, 7-5. Juricova served for the second set at 5-4, but Gibbs, who had beaten Juricova in Stanford's win over Cal last month, managed to break the senior in her final two service games. "I got an early taste of revenge this year at the Regionals," said Gibbs, the tournament's third seed. "And then again in the dual match season, but nothing feels sweeter than beating her at this tournament, because she took me out last year. I think I still owed her one." Gibbs has had long energy-sapping battles in the past two rounds, and she was happy to get out of the quarterfinal encounter with such a dangerous opponent in two sets. "It was a good match and the second set was really tough," Gibbs said. "I had to stay in the game at 5-all that I think could have turned the match the other way. She took it to me in the second set and encouraged me to start hitting the ball a little more, which is great, going into my match tomorrow." Juricova finished her career at Cal with an ITA Indoor singles title in 2009, an NCAA doubles championship in 2009, the NCAA singles championship in 2011, and reached the team final with the Bears in 2009. "It's obviously not how I wanted to finish," said the senior from the Slovak Republic, who also lost in the doubles quarterfinals. "It was a pretty tough day today. I think I had a really good career for Cal, and I always enjoyed it. I think I improved in the four years, and I want to continue playing so I'll play professionally, starting this summer. 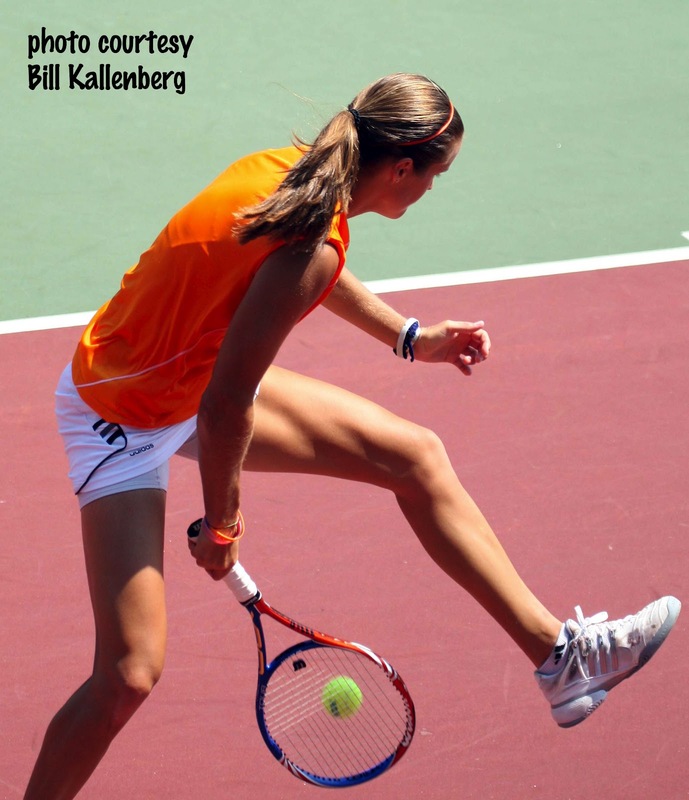 College is over, but not tennis for me, so I feel like I'm not done yet." Gibbs has another loss to avenge tomorrow when she faces top seed Allie Will of Florida, who beat her in Stanford's dual match win over the Gators back in February. Will defeated No. 7 seed Cristina Sanchez-Quintanar of Texas A&M 6-3, 6-3 and said she is finally beginning to find her form in the tournament. "I've been struggling a little bit at the beginning mentally," said Will, a junior. "Today I was a little more relaxed, got a little more depth on my shots and I went after it today. I really went for the win and I think that's why I was successful." While Will has the three-set win over Gibbs in Stanford as a positive memory, their previous meeting in the NCAA singles tournament, in last year's round 16, was less so. Gibbs trailed 5-1 in the third set, but came back to force a tiebreaker, which she the won to claim the nearly four-hour match. "She's an incredible player," said Will. "We've battled a lot, I know I played her at Stanford and we had a really long three setter as well, so I know I've just got to be mentally prepared. I know she's going to fight just as hard as I am." The women's singles semifinals are scheduled to start at noon, followed by the men's semifinals. The doubles semifinals are also set, with only one seeded team advancing in both the men's and women's draws. Top seeds Chase Buchanan and Rola will play unseeded Paval and Webb from Oklahoma in one men's semifinal. In the other, twins Chris and Marcel Thiemann of Ole Miss will face Carvalho and Escobar of Texas Tech. In the women's doubles, Burdette, the 2011 champion, and Gibbs, who are second No. 2, will play Natalie Pluskota and Kata Szekely of Tennessee. Pluskota and Szekely saved three match points in their 6-4, 4-6, 7-6(3) quarterfinal win over Florida's Lauren Embree and Joanna Mather. In the other semifinal, UCLA's Courtney Dolehide and Pam Montez will play Georgia's Nadja Gilchrist and Chelsey Gullickson, who were doubles semifinalists in 2010. By reaching the quarterfinals, as Gilchrist and Gullickson did with their win Friday, both earned All-American honors. For Gullickson, that win gave her the rare distinction of being an eight-time All-American, the first in Georgia history. The doubles semifinals are scheduled to begin with the women's at 4:00 p.m Sunday, followed by the men's. 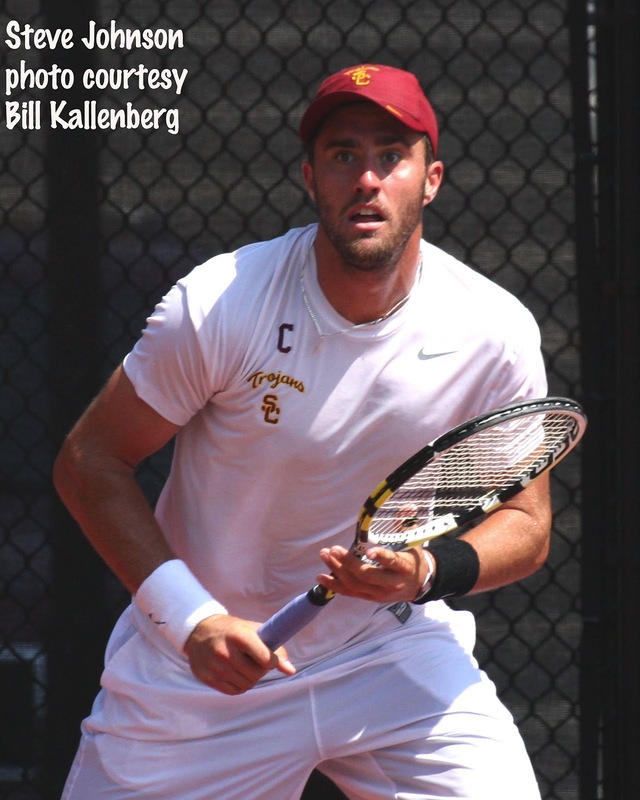 Top seeds Steve Johnson of Southern California and Allie Will of Florida survived temperatures in the 90s Friday to advance to the quarterfinals of the NCAA singles championships at the Dan Magill Tennis Complex. Because Johnson was still in doubles, he had a 10 a.m. start time against unseeded Neal Skupski of LSU, which was definite advantage in conditions very unlike those in Stanford last year. 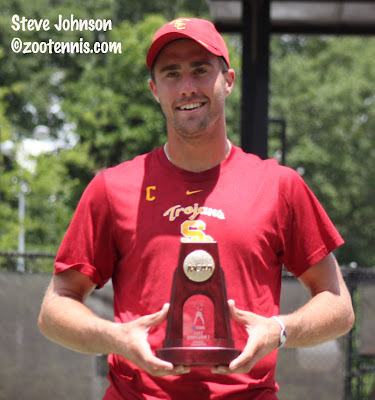 Johnson had played Skupski last fall in the first round of the Costa Mesa Futures, where the USC senior went on to win the title, and his 6-4, 7-5 win there was similar, except for the unfortunate ending. With Johnson leading 6-3, 5-5, 0-30, Skupski ran hard to cover his forehand corner and fell, injuring his left ankle. A trainer was called to the court, and because Skupski was lying close to court 2, play was suspended in the women's match next to them while he received treatment. After limping to the changeover bench, Skupski had his ankle wrapped, but was unable to continue, giving Johnson his 69th consecutive collegiate victory. "I played him in Costa Mesa and I knew he was a good player, there was no doubt about it," said Johnson, who also won his doubles match with Roberto Quiroz later in the afternoon. "He's got a big game--big serve, big forehand, comes in well. In the first set I was fortunate enough to get a break and serve my way through it. In the second set, I don't recall a break point until 5-all. It's really unfortunate what happened. That's not the way you want to win. It was tough watching." Next up for Johnson is unseeded Alex Domijan of Virginia, who managed a 6-0, 3-6, 6-2 victory over Alex Musialek of Kentucky, a 9-16 seed. "I've never played him," said Johnson, who didn't meet the sophomore even back in their days of the USTA junior circuit. "But I know he's not just going to go out there and see what happens. He'll have a good game plan, and I'm excited. I've been looking forward to getting a chance to play him." Will followed Johnson onto Court 1, starting her match around noon, with the heat building relentlessly. Will's opponent, unseeded Abigail Tere-Apisah of Georgia State, was making her first NCAA appearance, but she held her own, especially in the second set, breaking the Florida junior when she served for the match, before falling in the next game 6-1, 6-4. "I've been getting better mentally every single day," said Will, who reached the quarterfinals for the first time in her career. "Today I hit the ball a lot deeper, but went through some rough patches on my serve, and she made me pay for that." Will's opponent in Saturday's quarterfinal is No. 7 seed Cristina Sanchez-Quintanar of Texas A&M, who also advanced in straight sets, defeating unseeded Petra Niedermayerova of Kansas State 6-4, 6-3. The other women's quarterfinal in the top half is a rematch of last year's semifinal, with defending champion Jana Juricova of Cal, seeded sixth, against No. 3 seed Nicole Gibbs, of Stanford. Juricova defeated unseeded Aeriel Ellis of Texas 7-6(4), 6-2, and Gibbs won another grueling two-setter, beating unseeded Natalie Pluskota of Tennessee 7- 6(1), 7-6(6). Pluskota hit the shot of the tournament, a tweener that kept her in a point that she eventually won, but it may a shot in the second set tiebreaker that she'll remember more vividly. After Gibbs had come back from 5-1 down in the tiebreaker, Pluskota earned a set point, but missed a routine overhead into the net, and Gibbs survived. Another all-Pac-12 quarterfinal is scheduled in the bottom half, with Sabrina Santamaria of USC, the only unseeded player left in the women's draw, against fellow freshman Zsofi Susanyi of Cal, a 9-16 seed, who beat No. 4 seed Robin Anderson of UCLA 7-5, 6-4. Santamaria, who went undefeated in her team's three dual matches last week, beat two-time NCAA quarterfinalist Nina Secerbegovic of Baylor 6-4, 6-4, her third consecutive straight-set win. Like Georgia's Chelsey Gullickson, who Santamaria beat in the opening round, Secerbegovic is a big hitter, which doesn't faze Santamaria. She varies her approach depending on her opponent. "I like playing both kinds of players, [those] who give me pace and give me no pace," Santamaria said. "When they don't give me pace I like to slam forehands, banging the ball is always fun too. So I like any style of play." The other quarterfinal in the bottom half has No. 2 seed Trice Capra of Duke against No. 5 seed Mallory Burdette of Stanford. Capra beat friend and former junior rival Lauren Embree 6-1, 6-3, while Burdette continued her impressive form, defeating Zoe Scandalis of USC, a 9-16 seed, 6-0, 6-3. 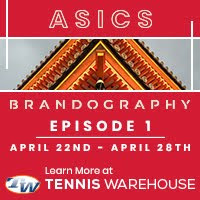 The men have two unseeded quarterfinalists--Domijan and 2010 NCAA champion Bradley Klahn of Stanford, who beat Chase Buchanan of Ohio State, a 9-16 seed, 6-4, 5-7, 6-2. Klahn had never beaten Buchanan before, and when he missed his opportunity to take a 4-0 lead in the second set and ended up losing it, it appeared that string would continue. "I was kicking myself a little bit," Klahn said of the two break points he failed to convert with Buchanan serving down 0-3 in the second set. "Just kind of sensing the importance of those and knowing that I need to take advantage of those opportunities against him." When he didn't, Buchanan raised his level and finished the second set playing his best tennis. In the third, Klahn was able to learn from his mistakes in the second, when he admitted he took his foot off the gas. "I think I got too far ahead of myself, thinking a game ahead, instead of focusing on what I need to do to have the best opportunity to win that point. I thought I did a much better job in the third set, especially when I got up that break, and carried that momentum." Klahn's opponent in the quarterfinals is Nik Scholtz of Ole Miss, a 9-16 seed. Scholtz, a freshman, spent even more time on the singles court than Klahn did, eventually getting past unseeded Louis Cant of Mississippi State 4-6, 7-6(3), 6-4. 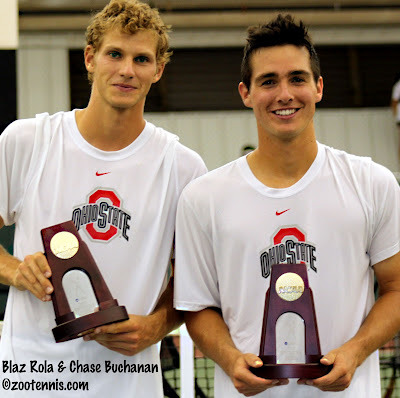 In the bottom quarter, Ohio State's Blaz Rola, a 9-16 seed who reached the quarterfinals last year too, will play No. 2 seed Mitchell Frank. Frank dealt 9-16 seed Wil Spencer, the last Georgia player left in the draw, a 6-1, 6-3 defeat in a rematch of the 2011 All-American final in Tulsa. With Frank and Domijan's wins today, Virginia has set a men's modern era (1977) record by putting a player in the quarterfinals for seven consecutive years. USC (1993-1998) and Stanford (1997-2002) held the previous record. Rola ended the college career of Dennis Nevolo, the No. 7 seed, with a 6-4, 6-3 victory. The other quarterfinal in the men's draw has No. 5 seed Henrique Cunha of Duke against No. 3 seed Eric Quigley of Kentucky. Cunha came back to beat Gonzalo Escobar 4-6, 6-2, 6-1, while Quigley had a tough battle with Artem Ilyushin of Mississippi State, a 9-16 seed, before posting a 7-6(5), 7-6(4) win. The doubles quarterfinals are also set, with No. 2 seeds Gibbs and Burdette the only seeded team remaining in the women's draw. Top seeds Buchanan and Rola and No. 2 seeds Johnson and Quiroz are through, as are Klahn and Ryan Thacher, the No. 4 seeds, who reached the semifinals here in Athens in 2010. Play begins with singles at noon on Saturday. #1 Steve Johnson (1), SOUTHERN CALIFORNIA def. #55 Neal Skupski, LSU, 6-3, 6-5, ret. inj. Andy Jackson, who was head men's coach at Florida for 11 years, resigned today, according to this release from the Florida athletic department. The word started circulating late Friday evening among the college coaches still in Athens, and those I spoke to acknowledged the domino effect of such a high-profile opening will be substantial. Like all Florida athletics, the head coaching job there is considered one of the nation's best, and although there are several high level coaches who would not consider it, it would be a lot easier to name those; the list of those wishing to interview for the position is certainly a long one. Jackson, who was hired by current Florida Athletic Director Jeremy Foley, had a perennial top 10 program while he was at Florida, but has had no Final Four appearances since 2005, and no national titles. The athletic accomplishment bar is very high in Gainesville, and the success of the women's program, which has reached the NCAA finals the past three years and won the last two team championships, has raised that bar even higher where tennis is concerned. On a personal note, I've interacted many times with Jackson both in college tournament situations and junior tournaments where he was recruiting and have always appreciated his candor and his obvious love of the game. I look forward to seeing him in future tennis travels. Before the start of today's round of 16 in singles, I wanted to post a link to my recap of the NCAA Division I men's and women's team event, which is now up at the Tennis Recruiting Network. Under difficult circumstances, the men's final between USC and Virginia was a tense and memorable match from start to finish, while Florida's win over UCLA was an impressive, if less exciting, display of tennis. In the midst of the second day of the individual tournament, I took time out to phone in to the USTA's conference call with Taylor Townsend and Patrick McEnroe. Townsend revealed that she recently did a fitness block with Pat Etcheberry in Orlando, likes clay better than you might expect given her game style, and will train in Spain prior to the French Open Junior Championships. The complete transcript, which includes several questions to McEnroe about player development in general, can be found at ASAP Sports Transcripts. The second day of the NCAA singles championship has extra significance, with any player who was not seeded in the tournament able to earn the right to call themselves All-Americans with a victory. On a hot and humid day at the Dan Magill Tennis Complex, 11 players qualified, most of whom are familiar to college tennis fans, including Alex Domijan of Virginia, who was seeded No. 2 in last year's NCAAs and Bradley Klahn of Stanford, who as 2010 NCAA singles champion, probably doesn't need additional resume building. But for Abigail Tere-Apisah of Georgia State, a 6-3 6-4 victory of Kata Szekely of Tennessee made her the first tennis All-American in school history, and certainly the first from Papua New Guinea. Just by playing in the tournament's first round, the 37th-ranked sophomore made school history, but she has a tough challenge if she hopes to continue her impressive run. She faces top-seed Allie Will of Florida, who defeated Danielle Lao of Southern California 6-4, 6-4. The other women to earn All-American honors with victories on Thursday are: Petra Niedermayerova of Kansas State, who defeated Diana Nakic of Baylor, a 9-16 seed, in three sets; Natalie Pluskota of Tennessee, who won a three-hour-plus marathon with Arizona's Lacey Smith; Aeriel Ellis of Texas, who saved match points for the second day in a row in beating Anya Morgina of South Carolina; Baylor's Nina Secerbegovic, an NCAA quarterfinalist the past two years, who beat Tennessee's Brynn Boren in a match that last three and a half hours; and Sabrina Santamaria of USC, who defeated Florida's Sofie Oyen and is the only freshman in that group. Joining Domijan and Klahn in earning the honor on the men's side are: LSU's Neal Skupski, who beat Georgia's Sadio Doumbia; Gonzalo Escobar of Texas Tech, who downed Costin Paval of Oklahoma, a 9-16 seed; and Louis Cant of Mississippi State, who beat Florida's Bob van Overbeek. The top two men seeds had little difficulty advancing, with No. 1 Steve Johnson of USC, the defending champion, beating Nassam Slilam of Florida 6-3, 6-2 for his 68th consecutive win, and No. 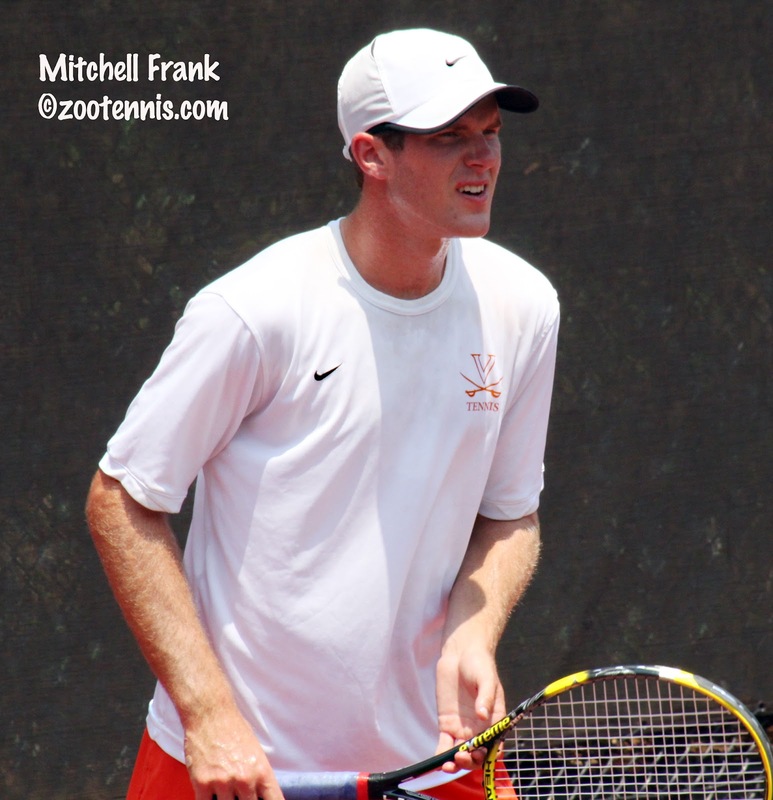 2 Mitchell Frank of Virginia who beat Johnson's teammate Raymond Sarmiento 6-4, 6-1. Sarmiento was up 3-1 in the opening set, but from then on Frank was the much steadier player, using his consistent depth to keep Sarmiento from using his wide variety of shots. "I kept the ball pretty deep and was able to get the ball down when he came in and make him come up with some tough volleys, which he is of course is going to do, because he has unbelievable hands, and is a great player," said Frank. "I think it was key to keep him back and keep the ball deep, and return well so he can't get in, and I think I did a pretty good job with that." Sarmiento wasn't as sharp as he was during the team competition, when he defeated Frank's teammate Domijan in the final, but much of that had to do with Frank's play. "When he had that break point in the first game (of the second set) you could kind of see him check out a little bit, and not be willing to go through the points as long as he was in the first set, staying with it." Frank said. "It was important to get him down, because if I didn't, I'd still be out here battling for a while." Women's No. 3 seed Nicole Gibbs of Stanford didn't make it easy on herself, trailing 5-1 in the first set to Florida's Joanna Mather and 3-0, two breaks, in the third set before posting a 3-6, 6-4, 6-3 win. "The heat was getting to me a little bit," said the 2011 NCAA semifinalist of the temperatures approaching 90 degrees. "I'm not used to playing long matches in this kind of weather, so I'm still adjusting. But I think that was really beneficial today, to know what it feels like and know I can play through those kinds of situations. With Mather serving for the first set at 5-1, she and Gibbs played at least 20 minutes before Gibbs finally got the break. And although she ended up losing the set, Gibbs felt that lengthy game was important to set the tone. "That was a huge statement on my part," said the sophomore. "I was in that game as much to affect her as much as I was to stay in the set, to let her know that I was sticking around and that I wasn't going to lay down for her because it was hot out." Mather, the 2011 Indoor finalist, hits her forehand with a lot of pace, and Gibbs admits the Florida senior is not a good matchup for her. "I've always really struggled playing her," Gibbs said. "She brings a lot of power to the court, hits a very flat ball that I have a hard time finding my offense off of. Since I've been working on my game to try to become more offensive, it's really frustrating for me not to see the balls I'm accustomed to seeing off of good shots and that's why she's tough." Gibbs, down 3-0 in the final set, managed to win the final six games of the match, and just as in the first set, another long game provided the jumpstart. "We had a really long game at 3-0 and again I worked my way back into the match, and just kept trusting what I was doing, and in the end, she was breaking down physically as much or more than I was." Friday's action will see several interesting matchups, with Florida's Lauren Embree, a 9-16 seed, against No. 2 seed Beatrice Capra of Duke in a renewal of their junior rivalry and UCLA's Robin Anderson, seed No. 4, against fellow Pac-12 freshman Zsofi Susanyi, a 9-16 seed, from Cal. On the men's side, there is a Big Ten clash between No. 7 Dennis Nevolo of Illinois and Blaz Rola of Ohio State, a 9-16 seed, and Klahn against Ohio State's Chase Buchanan, a 9-16 seed. The first round of doubles went late into the night, and there were plenty of surprises in the women's draw, with four seeded teams losing, including top seeds Will and Oyen of Florida. Emma Burgic and Secerbegovic of Baylor took out the top-ranked team 7-5, 6-2.